Here’s one of the few images I took on this recent trip – the weather wasn’t too great for photography, much as it hasn’t been all summer long. We started our hike with drizzly, cloudy socked in skies and and cold damp air. The weather improved a little over the 8 days, but never for long. The rain and cold threatened pretty much constantly. This particular morning the skies were partially clear, but by lunch time the clouds ad rolled in and the blue skies gone. I was hoping to get at least something from this area, because it’s such a great scene. 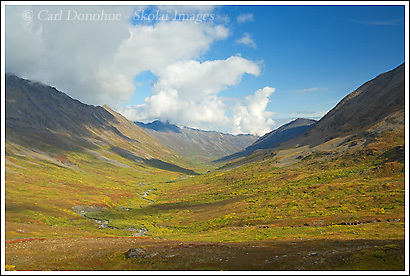 The broad alpine valleys really appeal to me, the expansive Alaskan landscape feels so welcoming to walk through. This was taken right from our little kitchen area, and the fall colors were great. The evening before was dreary, though the damp air really made the colors pop a little more. This was taken just east of Bremner Mines, in the Monahan Creek drainage, on our trek from Iceberg Lake to Bremner Mines. This entry was posted in Adventures, Alaska, Backpacking and Hiking, Fall, Landscapes, Travel, Wrangell - St. Elias National Park on September 5, 2008 by Carl D.
I hate the weather has been fighting you so much this summer. That’s a beautiful pic, though! Hope things improve. Do you have anymore treks planned this year? I moved to the N.Ga. mountains and the 1st week I was here a tornado hit! No damage here, though, thankfully! Stay safe! Classic alpine country in autumn Carl! I’m normally not a weather complainer, but this summer has been awfully frustrating. I understand it has been the coldest summer in recorded history. At least we haven’t had tornadoes! Glad all is well with you Beth. I’m heading out on the 7th for another trip – we’ll see what the weather brings us. Yeah, it’s been a bummer – I can’t believe it’s over already. Hey Ron, thanks for the good Karma! We’ll pass it on to Carl, too! !